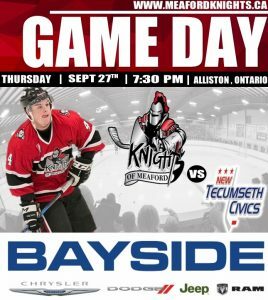 Tonight, the Knights are on the road to take on the New Tecumseth Civics in their first game of the 2018-2019 season ! Puck Drop ,7:30 PM at the New Tecumseth Recreation Centre in Alliston, Ontario. Tune in to GMHL.TV to stream the game live or join the Meaford fans making their way to the Civics rink to cheer on the team! 2018-2019 Season Tickets On Sale Now – Early Bird Special!